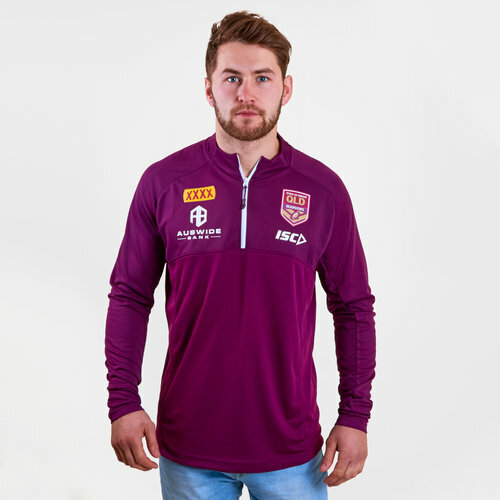 Cheer on the Canetoads with this Queensland Maroons State of Origin 2019 Elite Rugby Training Top from ISC. The Queensland rugby league team represents the Australian state of Queensland in rugby league football. The team plays three times a year against arch-rivals New South Wales in the State of Origin series. Since 1908, a rugby league team representing Queensland has been assembled from players based in the state to compete annually against New South Wales. As of 2018, the Queensland Maroons have won eleven out of the past thirteen series, including a record-breaking eight successive State of Origin victories between 2006 and 2013. Give training your all with this elite top that is worn by the players in each training session. Sticking to tradition this top is maroon with the ISC logo and club badge on the left.